WHAT TO ASK YOUR APARTMENT MOVERS BEFORE YOU HIRE! 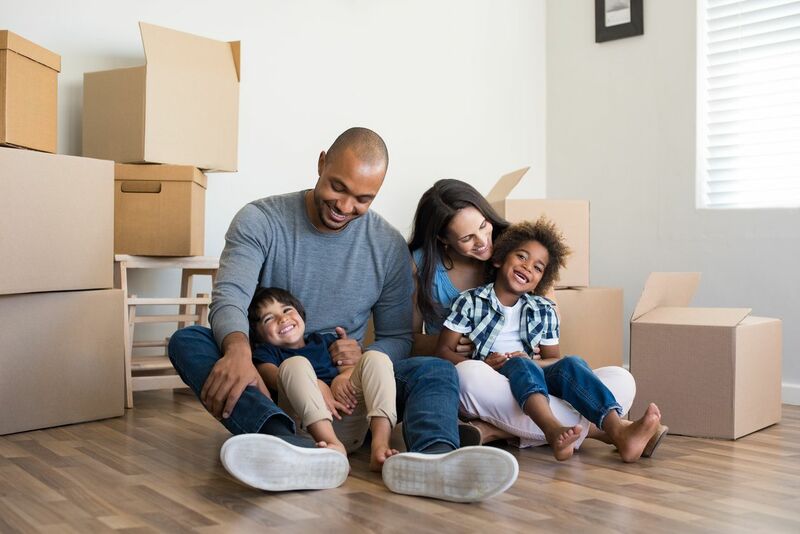 For those who are moving out of or into a rental, there are a few additional details in play from your single family home to home move. Thankfully, our professional moving teams are ready to get the job done and up to the challenge of a few stairs, a few flights an even an elevator. With more than three decades of moving experience under our belts, we’ve seen it all when it comes to moving apartment rentals. These facilities often have strict rules and regulations to follow, and our professional moving help writers can tell you how to save time, money and help you hire the best apartment movers for you. Time and money are at a premium when completing a rental move, and our moving teams know how to save you both. Our understanding of the regulations for rental properties allows us to navigate the move with precision and safety. Find apartment movers that will wrap all doors and walls, and protect elevators while moving your belongings, which helps eliminate property damage so you can get your security deposit back. Hiring the best apartment movers to complete your rental move also allows you to stay in your location longer because hiring our professional moving teams makes it a quicker process than doing it yourself. 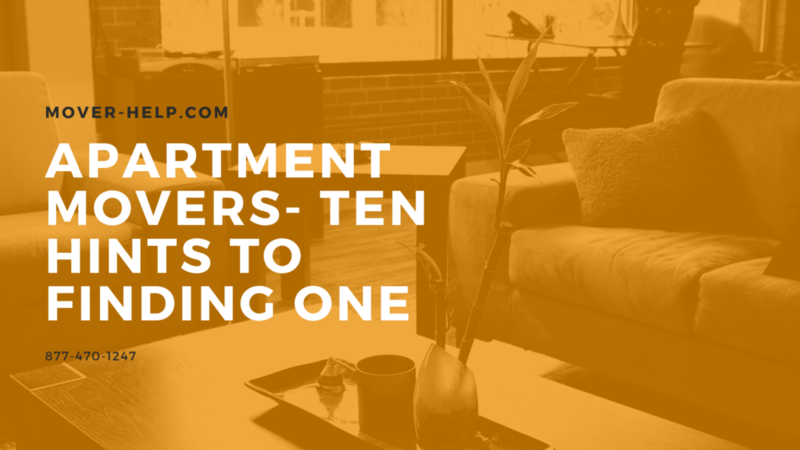 For those about to complete a rental move, we have developed an effective list of tips for first-time renters! This tenant move out checklist will cover all of the bases you need when completing a move from a rental property, and can be your go-to rental checklist for any future moves you complete. Get rid of unnecessary items: Find somewhere to donate items you no longer want, offer other items to people who might want them, or just throw them away all together. This will save you the hassle of moving these items on moving day. Notify your landlord of the upcoming move: Some rental properties need a written notice in advance of your move, so be sure to check with your property on the proper procedure, and check to see if they have certain regulations for moving in and out of the rental. 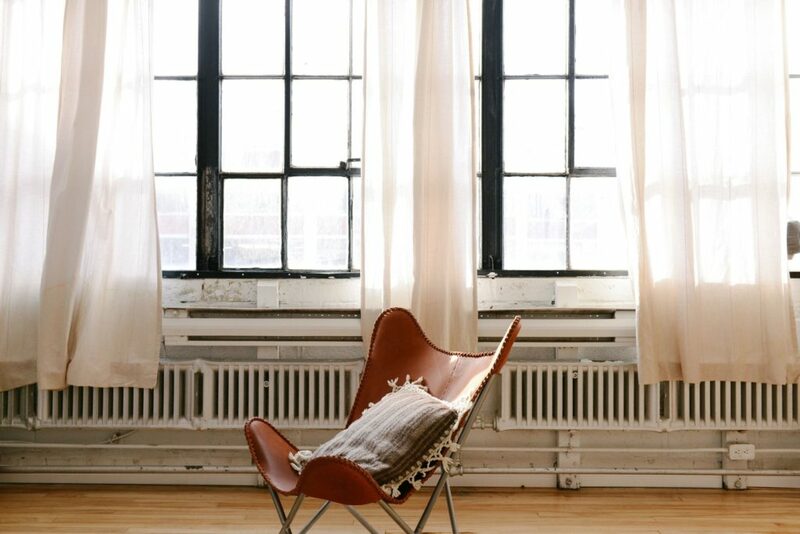 Do a thorough cleaning: Leaving your place in bad shape will end up costing you money. Do an efficient cleaning of your rental property before moving out and fix any damages to ensure you receive your security deposit back. Take care of bills: Double-check and ensure all bills are paid in full and shut off so you aren’t stuck paying for something at your next location. Document the condition of your rental: Be sure to take note of any damages or other incidents that occur to make sure you aren’t charged for something you didn’t do. Moving apartments? Apartment moves are a whole different animal than full-home moves. For starters, you probably have less stuff packed into a two-bedroom apartment than you might in a two-bedroom house which means you also have more flexibility in the kind of help to choose from. Also, apartment moves may require you to get a little crafty in navigating stairwells and potentially long hallways. 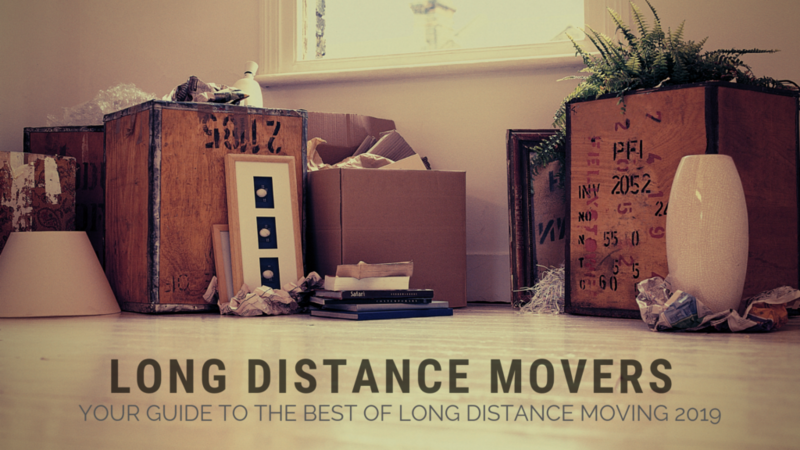 So whether you need a full-service moving company to maneuver your futon through a pesky narrow doorframe or a moving truck to put that futon in, we’ve put together the best small moving companies to help you with your apartment move. Read on to see if you should roll up your sleeves and rent a truck or container or fork over some extra cash for full-service movers. 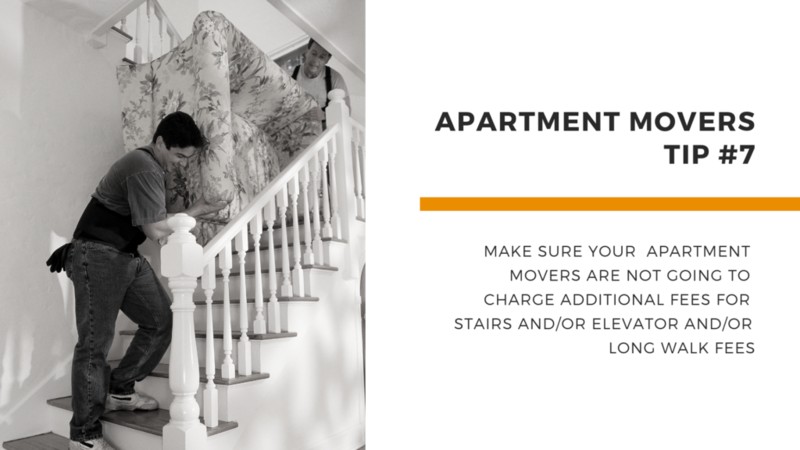 If you have a load that’s too large to move on your own, if you’re on a time crunch, or if you need help carrying your furniture up and down multiple flights of stairs—if you live in a fourth-floor walk-up, for example—a full-service moving company is the best place to start. Although hiring a full-service mover is the most expensive option on our list, it’s also the most convenient. Plus, with add-ons like packing and storage services, it allows for customization. You can scale back the services you don’t want so you don’t have to break the bank—or your back. Some apartment movers like Monster Movers prices its long-distance moves based on the overall weight and mile count. Meanwhile, it prices local loads by the hour. If you have a studio apartment-sized load, this is great since you could probably pull off the move in a couple hours anyway. A company’s availability in your area for your moving dates determines whether or not you can do business with them. Usually, moving companies will have a page on their website that lists their locations, offerings, and operating hours. There’s no sense paying for the largest available truck on a smaller job like a one-bedroom apartment. The more options a moving company offers beyond just small, medium, and large sizes the more opportunity you have to get the most bang for your buck. For apartment moves, long-distance moves are normally more cost-effective than local moves since local moves charge by the hour. And since apartment moves have smaller loads than full-home moves, paying by the hour can work in your favor. If you’re making an apartment-sized long-distance move, expect to pay significantly more than a local move. Rates for long-distance moves are based on the combined weight of your load and mile count. Most moving companies charge extra based on how many flights of stairs movers have to hike. Every company handles this differently, so asking around and comparing prices can help you find the company with the most reasonable costs. Did you decide to go full-service or rent a truck or container? No matter your method, we’d love to hear about your experience. Let us know in the comments section below, and while you’re at it feel free to call out a small moving company you think should have made the list. Depending on the housing market, moving in the fall is typically much more affordable than summer. Moving companies have cleared the summer rush, gas prices can be lower, and there is more truck/crew availability. You may have a number of clothing items, swimwear, beach gear, outdoor furniture, toys, and other seasonal items that just won’t make it to next summer. Instead of packing and moving these items, only to discard them next year, take some time to declutter and items you don’t want to pay to take with you. And, if there are old cold-weather clothing items you or your family have grown out of, consider donating those before the colder weather hits. If you live in a climate with challenging seasonal weather, reconsider the benefits of putting some items in storage during your move. 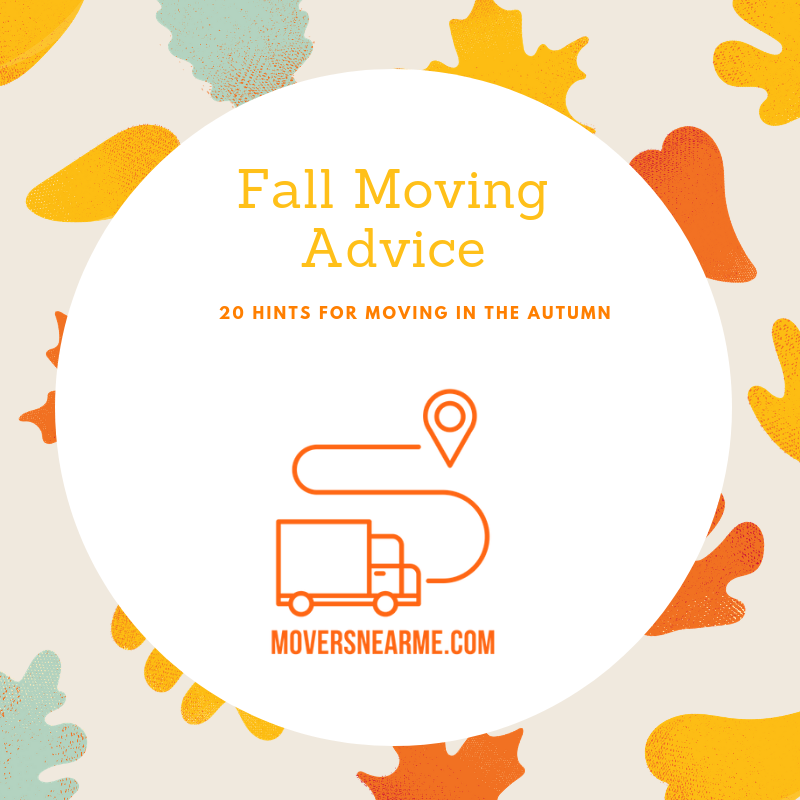 This will help clear your moving truck of heavy or bulky items you may not use until late next spring or summer (like outdoor furniture, gardening tools, and barbecues), and can streamline your move by helping you pack everything at once. It will also make move-in that much easier when you arrive. While you’re considering bulkier items, don’t forget about clothes and sporting gear that you may not need right away after the move. Pack seasonal items together so you can find them easily later – and make sure you’ve left out all those cold-weather items you’ll need shortly after you settle into your new place, like rain boots and raincoats, snow gear, and snow-removal equipment. If you’ve stored them away, now’s a good time to make sure they’re easy to access and unpack after you’ve arrived. If you’ve stored away crock pots and sandwich presses, large dutch ovens, and other seasonal dishes and service wear, consider talking to your movers about placing them in more accessible locations in your house or apartment upon your arrival. Instead of trudging out to the garage or down to the storage closet to find items you packed away last year, they’ll be in your kitchen or dining room, ready to be put into service for the fall and winter seasons. There’s nothing worse than arriving in a new place during the chilly, wet fall to find you haven’t set up all the proper utilities like electricity and gas. Often times, waits for new accounts can be several days. Not so great when the temperature drops. So be sure you’re clear on what’s required to setup or transfer your accounts, so that you arrive to a warm, bright environment on day 1. When both moving in and moving out during the fall, the potential to track in wet leaves, dirt, and mud increase. You want to get back your security deposit, or at least ensure your post move-out cleanup doesn’t involve plastering holds in the walls of your apartment or steam-cleaning rugs. So buy plastic painter’s sheeting, or cut open large black trash bags and tape to entryways and other pathways where movers and friends will be coming and going. When you arrive at your destination, be sure the movers wait for you to lay down more plastic before unloading your items. During the fall, no matter your preparation, you’re going to track in a lot of leaves and dirt. Have a broom, paper towels, and sponge mops ready so you can clean as you go. This will ease the post-move cleanup, and help to avoid tracking materials into and out of your moving truck, onto your furniture and boxes, and into your new home or apartment. Despite your precautions for protecting your existing and new home or apartment, you should take extra steps to clear the outdoor paths to and from the moving truck to avoid dangerous situations. Sweep away leaves and shallow puddles with a stiff broom, and put down flat pieces of cardboard in any particularly wet, muddy, or slick spots. Another helpful fall moving tip requires cleaning while you go can help keep your place tidy and can also help avoid injuries you might sustain while carrying heavy items to and from your place. Rain is the worst for moves. There’s simply no avoiding taking your things outside into the weather to load them into the truck. So be sure you have an ample supply of umbrellas and other plastic covering to keep furniture, upholstery, and boxes dry as they’re loaded into and out of the truck. Wet boxes can break or mold—especially if headed for prolonged storage. And it’s just no fun starting out in your new place with a wet couch. We know, you’re probably used to the tried-and-true moving uniform: running shoes, shorts, and old T-shirt and a baseball cap. But during the fall you’re going to have to plan ahead or colder, and potentially wet weather. Be sure you’re wearing shoes with good traction, have a hooded rain jacket on hand, and that you’ve considered layers so you can dress up or down depending on temperature fluctuations, and how challenging your move becomes. Start early on your vending efforts to maximize profits. Personally, we’re fans of services that allow you to make money from the comfort of your own couch (who isn’t?). Heavy items are one of the main reasons people hire expensive help on moving day. After all, no one wants to throw out their back while lugging an outdated stereo system down the stairs. But trust us, with a couple of hacks, you’ll be able to keep your cash and your back. Let’s talk about books. Your expansive, curated literary collection is impressive when it’s up in shelves; on moving day, it’s just a pain. Rather than tossing those tons in boxes, pack them in a rolling suitcase, and voila: a portable library. Think creatively with other heavy items, such as furniture. Remove any attached parts, like legs and drawers, to make the bulk significantly lighter. And always place a piece of cardboard under a heavy item to prevent scratches on the floor. Finally, push instead of pulling -– it’s easier on your body. We know, we know – it’s moving day, not your wedding day. But go ahead and get into that planning mentality anyway: Pick the date and time you want to move well in advance, and you could end up saving a ton of cash. 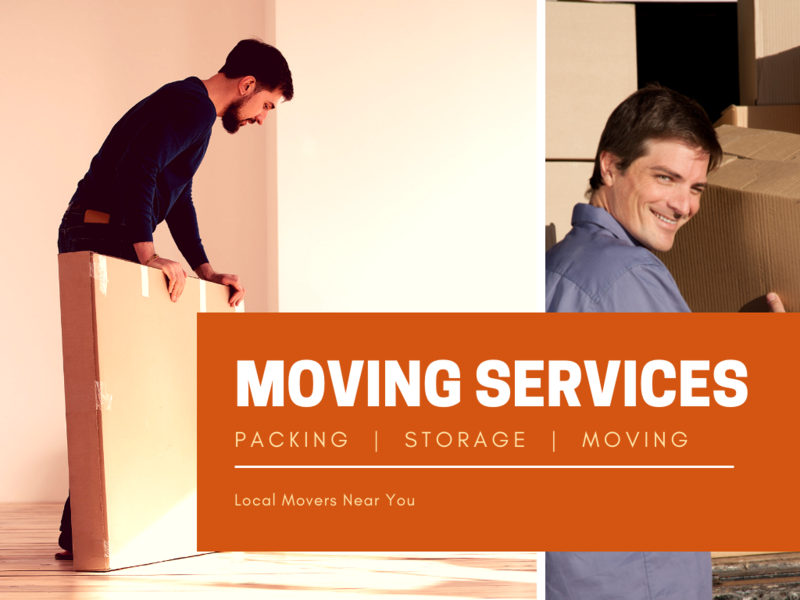 Moving in October, November or December moving both mid-month and mid-week will save you the most money as every moving service from storage to moving trucks and full-service movers – is cheaper in the middle of the month. Finding out how much your furniture weighs in key to getting a guaranteed quote – find a moving calculator here. When it comes time to wipe down your old apartment, instead of picking up new cleaner, use what you already have. A half-empty bottle of vinegar, a past-ripe lemon, and some old rags may be all you need for a through ceiling-to-floor clean. As for kids, your move is exactly the time you should call in a favor with your family. As lovable as they are, kids and pets can cause damage during a move and make the move take longer as movers aka. friends you’ve bribed have to negotiate around them as they run around during moving. Using a private, flat rate moving company that won’t swap, sell or unload your shipment is crucial to avoiding damage, missing items or pricing that drastically changes. While this isn’t necessarily related to your move, relocation is a good reminder to do those things you’ve been putting off throughout the year. While there’s a lot you can do online, some things, like your car, require professional support. So take your ride for service to ensure it’s running and in good shape prior to the colder, wetter seasons. You should keep personal papers, social security card and other irreplaceable items with you in a suitcase. Whether you’re moving across the country for a new job opportunity or you’re moving back to your parents house, there are many factors to consider when choosing a cross country moving company —and finding the best moving companies cross country can be a challenge. 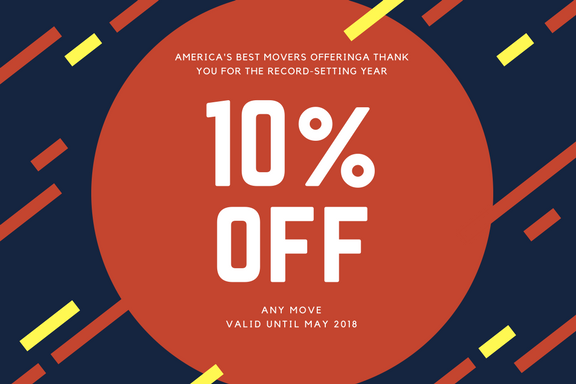 Mover-Help.com is chock full of research, verified user reviews, and over 100 years of moving company industry knowledge help make your choice easy. If you’re looking to find the best interstate mover near you, check out our Movers Near Me tool. What determines the best moving companies for cross country moves? Excellent customer service is a must in a top-tier moving company. It affects your experience during your moving estimate, on moving day, and every time you need to get on the phone to ask your mover a question. 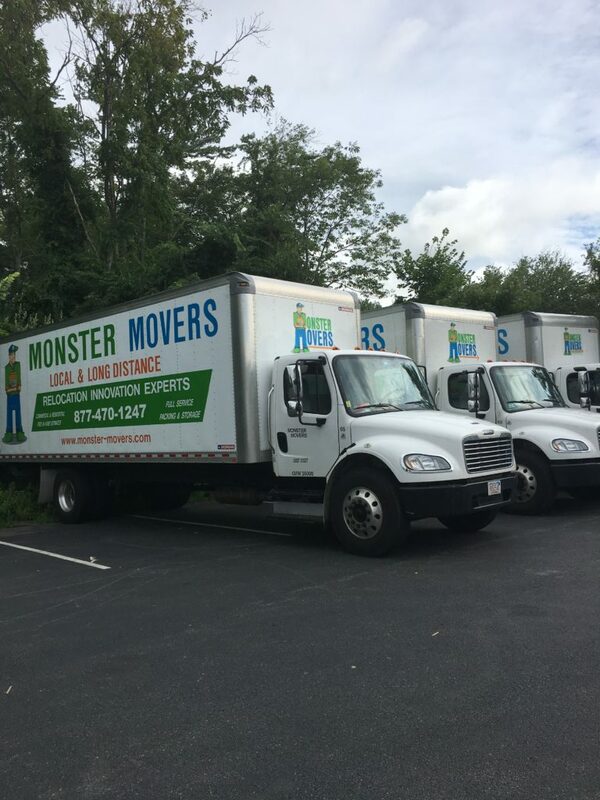 Monster Moving and Storage earned the top spot for a few different reasons. We preferred the over-the-phone estimate over the in-home estimate that many other long distance movers in the industry offer because it puts your comfort and convenience first. When you schedule an in-home estimate, you generally have to take time off work and make sure the house is somewhat presentable when the relocation consultant comes to conduct the estimate. During an over-the-phone estimate, you can go through each step in the process whether you’re sitting at your desk at work or you’re sitting in your house, surrounded by the clutter and empty takeout boxes that make it feel like home. 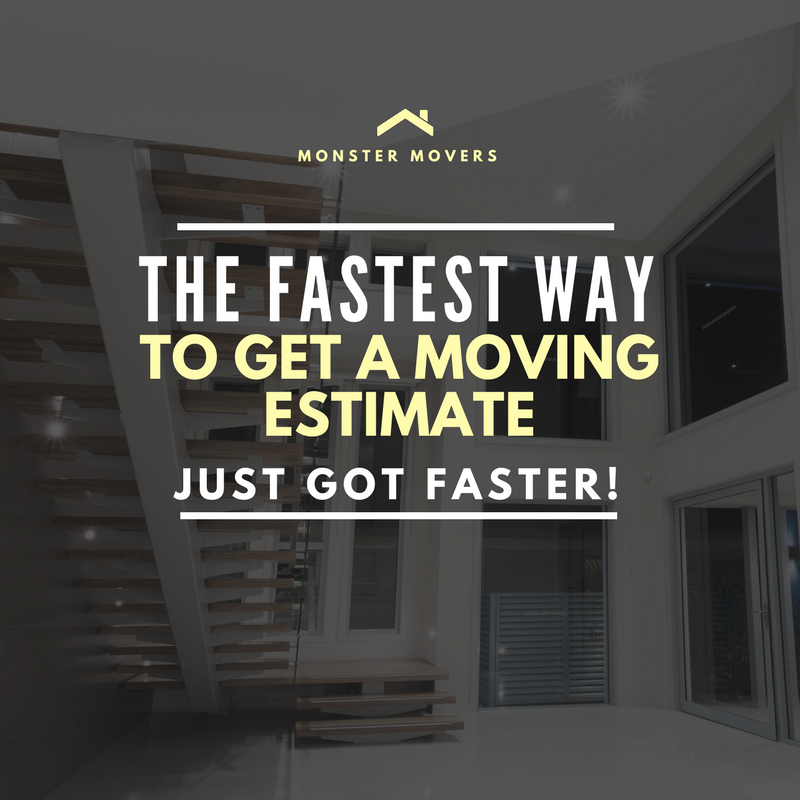 Monster Moving and Storage also claims that conducting over-the-phone moving estimates saves you money in the long run. Since it doesn’t have to pay someone to drive out to your home and conduct an in-home estimate, it can pass those savings along to you. 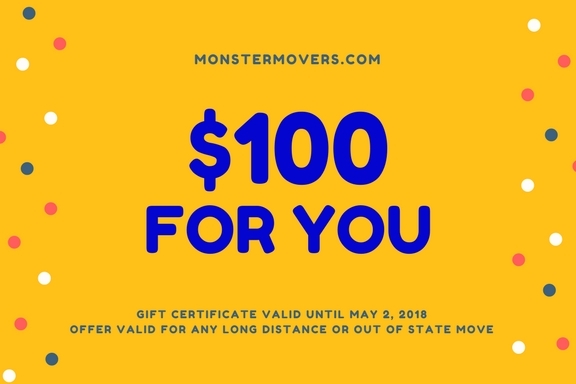 We aren’t focusing on price too much for our interstate moving company comparison since it varies so much from one moving scenario to the next, but Monster Movers pricing presentation deserves mentioning. 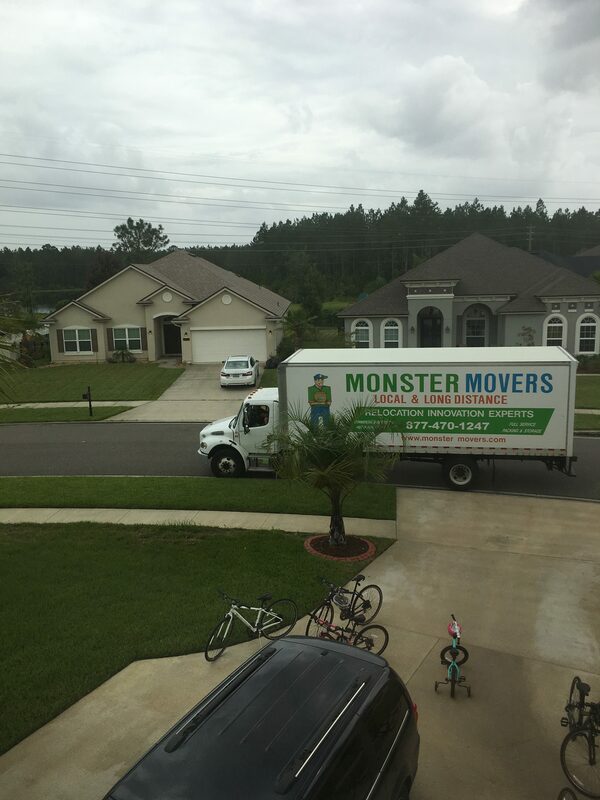 Of all of the moving companies we reviewed, Monster Movers had the most transparent pricing structure. Our relocation specialist emailed us our quote and explained each item while we were still on the phone during our over-the-phone estimate. We enjoyed how this gave us an immediate opportunity to understand what we’d be signing up for and allowed us to ask questions about pricing. The Monster Movers representative we worked with even encouraged us multiple times throughout our over-the-phone estimate to call other movers to see if we could get a better estimate. 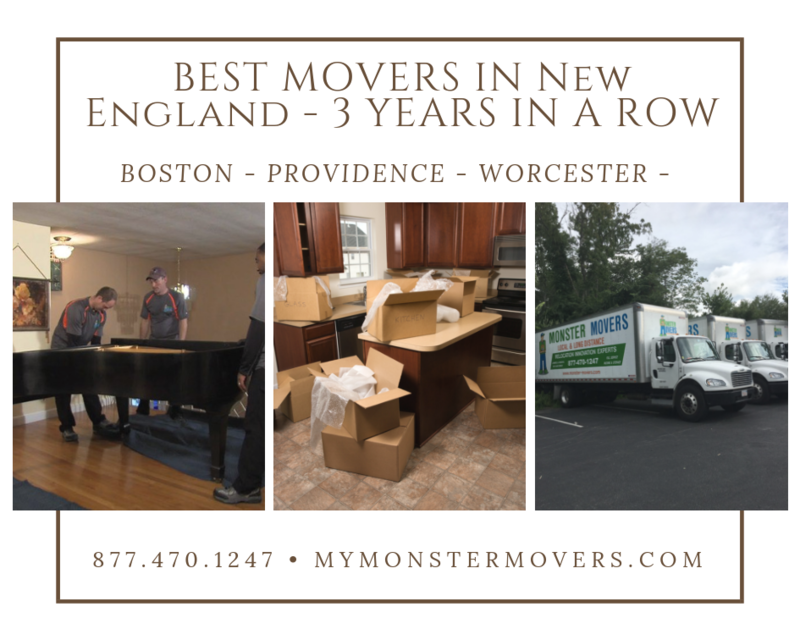 Of all of the moving companies we reviewed, Monster Movers had the most transparent pricing structure. 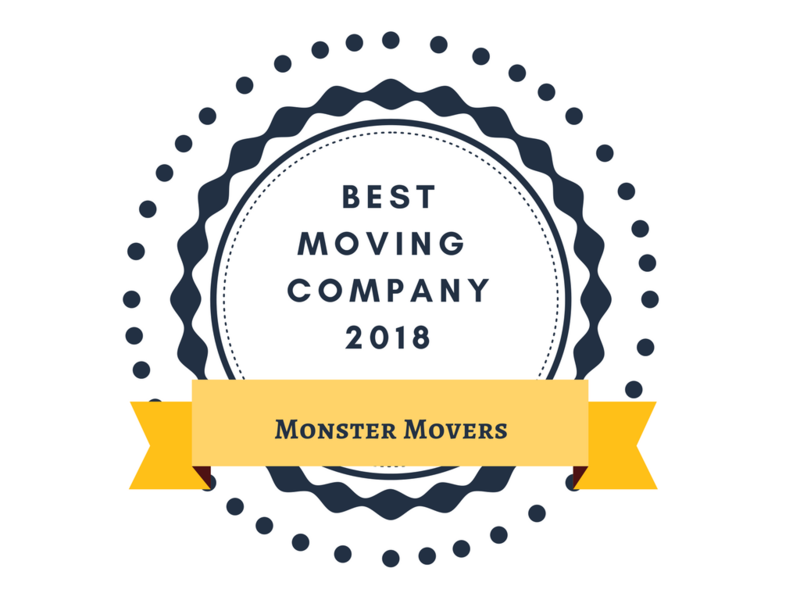 Monster Movers was by far the most responsive customer service experience we had while going through the moving estimate. 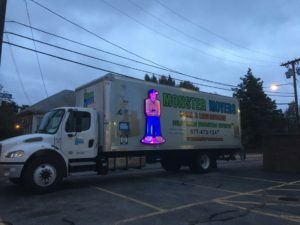 We reached out to Monster Movers by phone and through online chat through google to ask questions and follow up on our estimate, and its representatives were quick to respond through both channels in just a few minutes. Not only were they quick to respond, they were incredibly thoughtful and thorough in their responses too. Our Monster Movers representative also called to follow up with our estimate a few times to make sure all of our questions were answered and to ask if there was anything she could do to help us make our decision. Normally, this would feel like a badgering sales call, but our representative was kind and helpful, and they came across as having our best interest at heart. Monster Movers is a full-service moving company that maintains one of the largest moving networks in the world. Not only does it partner with plenty of agents (local moving companies) to meet your needs, it provides stellar service, too. In-home moving estimates are a pretty similar experience from one moving company to another. Thirty minutes before the estimate even began, Monster Movers relocation assistant gave us a call to confirm we’d still be available to meet with them and to see if we’d like any questions answered before our appointment. We liked this opportunity to ask any last-minute questions and we appreciated knowing about how long after the phone call we could expect them to arrive. 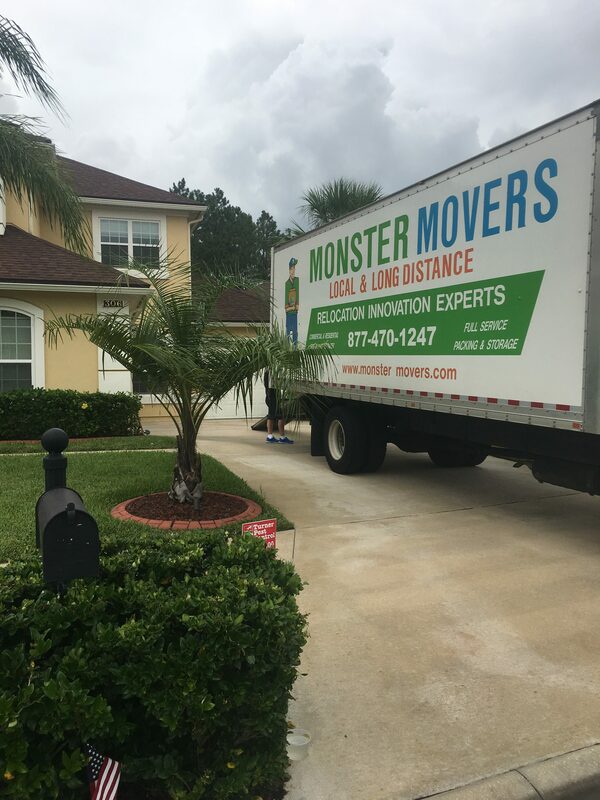 Once the in-home estimate was underway, it was evident that Monster Movers relocation assistant had our best interest at heart—achieving a comfortable, affordable move. We never felt like we were being sold anything during the process, which was a welcome experience. In fact, our relocation specialist even advocated for not using certain services because he didn’t believe they were worth the money for our move. 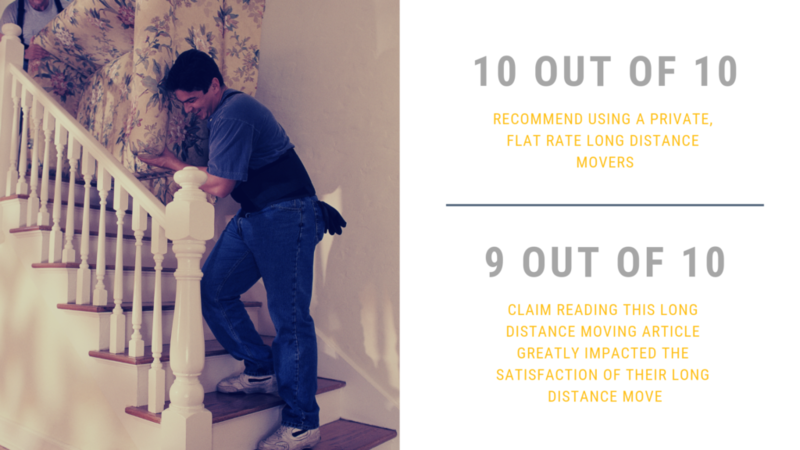 If we didn’t make it clear enough in reason number one, we’ll make it clear here—we were very impressed with Monster Movers’ customer service during each and every one of our interactions. The in-home estimate was just the tip of the iceberg. Each time we reached out to Monster Movers’s representatives to ask questions about our move, they responded quickly and thoroughly. It didn’t matter if we were giving them a phone call or sending them an email, each response was prompt and they didn’t make us feel like we were burdening them with our requests. If customer service is important to you, you likely won’t go wrong with scheduling your move with Monster Movers. 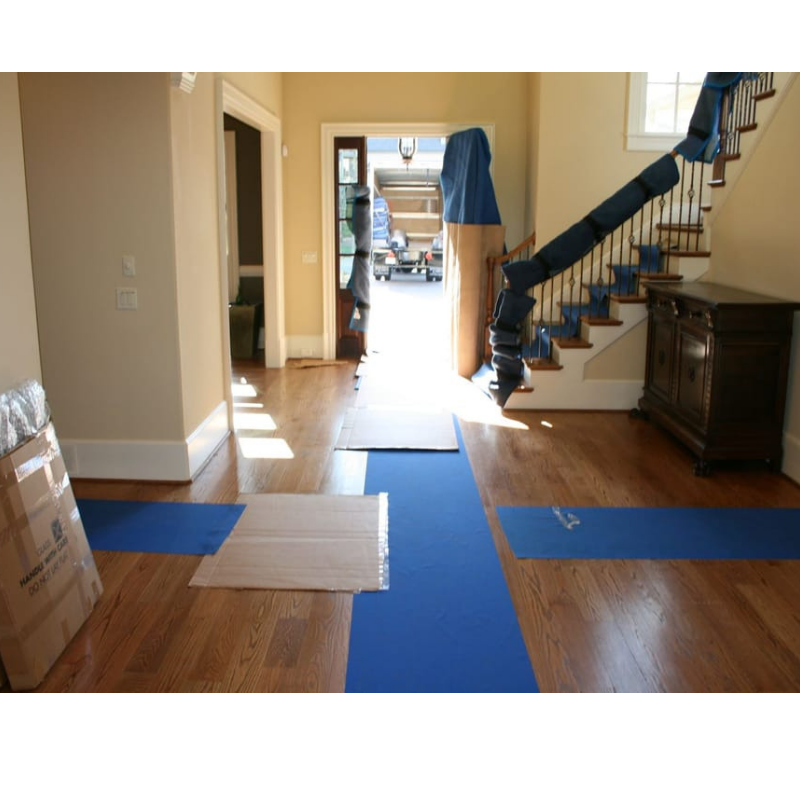 Monster Movers has a wealth of online resources on its website to help out in each stage of the moving process. They offer packing tips, handy moving checklists, and is the only cross country moving company to offer an instant cross country moving estimate all completely done online from the comfort of your own home. 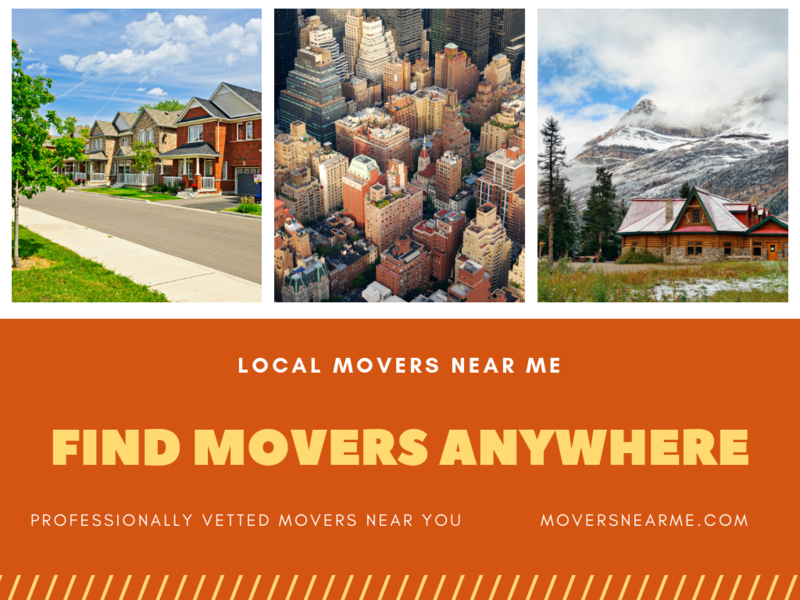 We believe a mover’s online resources should be a quick reference for the information you need without bogging you down and distracting you from all the other important tasks of moving. Many interstate moving companies offer additional services as well. If there’s something you feel would make your move easier—like cleaning debris from your old house or setting up utilities in your new one—be sure to choose a mover that can take care of your specific needs. Is hiring a professional mover worth the cost for your long-distance move? Everyone’s situation is different, but for a long-distance move, you likely won’t regret hiring a professional moving company. Renting a truck and doing everything yourself seems like a good idea on the surface. Advertised truck rental costs are fairly low, and a lot of people feel like their belongings are in good hands when they’re behind the wheel. The fact is, DIY moving costs add up and a lot can happen in the back of that truck if things aren’t packed properly. Here are a few things to consider when doing the math and deciding between a professional or DIY move. Time: Your time isn’t free, you know. Materials: Buying boxes and packing materials yourself can add up. Gas: Big moving trucks aren’t the most fuel-efficient vehicles on the road. Food: Purchasing meals on the journey between your old and new homes gets expensive, especially if you don’t plan on surviving off of gas station food. Lodging: If you’re moving a long distance, you’ll likely have to break your trip up over multiple days and find a hotel or two along the way. Insurance: Carefully loading your belongings onto the truck will only get you so far. If your things aren’t packed properly, some may break during the trip. You’ll want to buy moving insurance to make sure you’re covered in the event of a loss. After you add up the extra costs associated with a DIY move, going with a professional moving company ends up costing about the same (and sometimes less) than a DIY move, andyou save yourself the trouble of loading and driving the truck. Your pocketbook and your back will thank you. Before a cross country move, I highly suggest checking to see if the professional moving company is properly licensed and insured. Otherwise, you could end up engrossed in the drama that accompanies moving scams. Thankfully, this is easy to avoid. Check to see that the moving company offers proper insurance is also important. After all, moving mishaps do happen – even with the best of movers. So it’s important that you’re prepared. Licensed interstate movers are required to offer two types of liability options: Full Value Protection and Released Value. Full Value Protection: “your mover is liable for the replacement value of lost or damaged goods in your entire shipment…This is the more comprehensive plan available for the protection of your belongings.” The cost of Full Value Protection varies by mover. Released Value Protection: The most economical protection available is Released Value, since it is offered at no additional charge. However, the protection is minimal. Under this option, the mover assumes liability for no more than 60 cents per pound per article. Of course, if you select a long distance moving company from the vast network of cross country movers, you won’t have to bother asking this question. Every professional long distance movers that Moving.com works with is required to be licensed and insured. In addition to checking the moving company’s complaint history on the U.S. DOT’s database, I recommend researching and reading as many reviews as possible. Check the moving company’s online reviews and ratings on their website as well as on various review sites. I highly recommend looking at moving reviews through customer lobby – the reviews are guaranteed by bill of lading. Of course, word-of-mouth is still a great way to discover quality movers in your area. So don’t hesitate to reach out to friends and neighbors for recommendations and suggestions. Most people are happy to share their good experiences – and even happier to tell stories about their bad ones. If you don’t know many people in the neighborhood, try Nextdoor.com – a social network for your neighborhood community. Remember: it doesn’t hurt to ask! 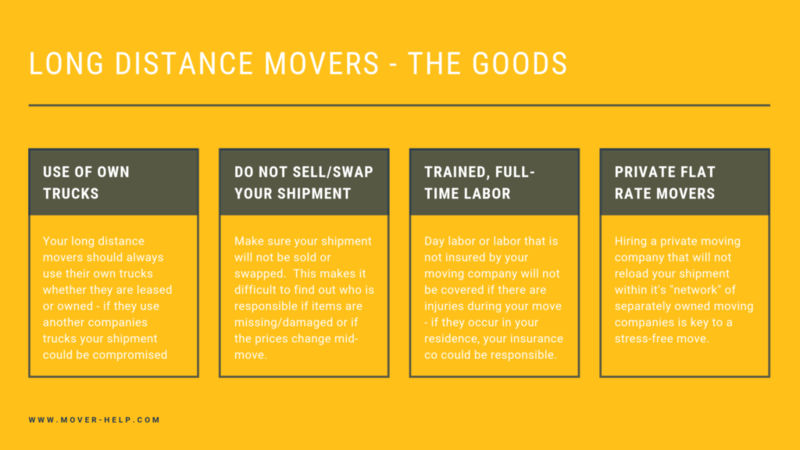 While a mover may look good on paper, someone’s personal experience could prove otherwise. Before hiring a cross country moving company, make sure they perform either an in-person inspection or a video survey of your belongings before giving you a quote for the cross-country move. You’ll know the moving company isn’t legitimate if they offer to give you a quote over the phone or internet (read: red flag! ), based on your own account of the inventory. The company should survey your things themselves to give you as accurate a quote a possible. Once the inspection is complete, the mover’s estimate should be sent to you in writing and include all possible costs. Keep in mind that an interstate move means the majority of the cost will be based on the weight of your belongings. So the less stuff you have to move, the cheaper. With this in mind, make sure the mover knows exactly what is coming with you. If you plan to leave large furniture behind, such as a bed or couch, inform the mover during the inspection. Before hiring a interstate moving company for an interstate move, make sure to ask whether the moving company will be picking up, transporting and delivering all of the belongings themselves – or subcontracting part of the move out to a different party. Many professional cross country moving companies use moving subcontractors. These subcontractors are not employees of the moving company, and therefore may not be subject to the same standards as the moving company you originally hired. If you’re comfortable with subcontractors handling part of your move then be sure to ask whether they are insured. If you’re uncomfortable with another party handling part of your move, I suggest finding a moving company that does not subcontract. How professional did the cross country moving company seem? Do they have a good reputation? Do they have a brick-and-mortar office and a professional moving truck? Do they have business cards and a professional website? Did the mover arrive in a timely fashion and answer all questions before, during and after the inspection? Did they provide you with an official Bill of Lading? Did something just feel off? Ask yourself these types of questions before hiring a moving company. Also, be sure to quiz the mover about his or her experiences with your particular kind of move. For instance, if you’re moving to a high-rise apartment building, a townhome with lots of steps, a house with a small doorway or a busy street, you should inquire whether the moving company has experience with the type of move. An experienced mover will be well-prepared to handle a move with steep stairs, elevators, parking limitations and more. I recommend choosing the moving company that gives you an estimate you’re comfortable with, and provides information about any and all additional charges. Remember: you don’t want any unwelcome surprises at the end of your stressful and exhausting move. The most common type of interstate moving estimate is the “non-binding estimate.” This estimate is the mover’s estimated cost based on the overall weight of your things combined with labor costs (i.e. loading, unloading, packing, etc). However, these estimates are “non-binding,” which means the final charge will be based on the actual weight of your belongings and any extra add-ons you require that are not listed in the estimate. When choosing a moving company, I suggest obtaining a non-binding not-to-exceed estimate. This ensures that the customer won’t have to pay more than the original estimate. STEP 3: Go through your house and add your inventory. This takes between 5-15 minutes. Other long distance moving estimators take upwards of two hours or longer especially if you have to wait for someone to come to your home for an on-site estimate. The most important thing to remember here is that the following moving costs are only approximate values that can serve you well to get a general view of what your long distance move will cost you. 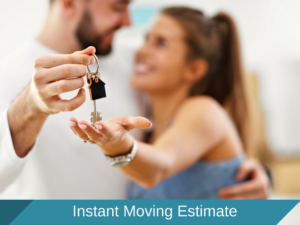 The best way to get a guaranteed long distance moving estimate is to use the long distance moving calculator. 1-bedroom apartment-. On average, household goods inside a 1-bedroom apartment can weigh between 2500 and 3500 pounds, which means that you’ll be paying within the range of $1800-$2500 for a long distance move. 2-bedroom home – On average, the items found in a 2-bedroom residence weigh between 5000-6000 you should be charged no less than around $3500-$4200 . Moving out of state or across the country is no easy feat. Whether you’re moving for a new job, to be closer to family, to live in a warmer climate, or for a different reason, the stress of relocation can take its toll. During this time of transition, the greatest help comes from hiring a long distance moving company you can trust to handle your move. As you can see hiring a reputable moving company is numero uno on the list of importance when moving cross country. 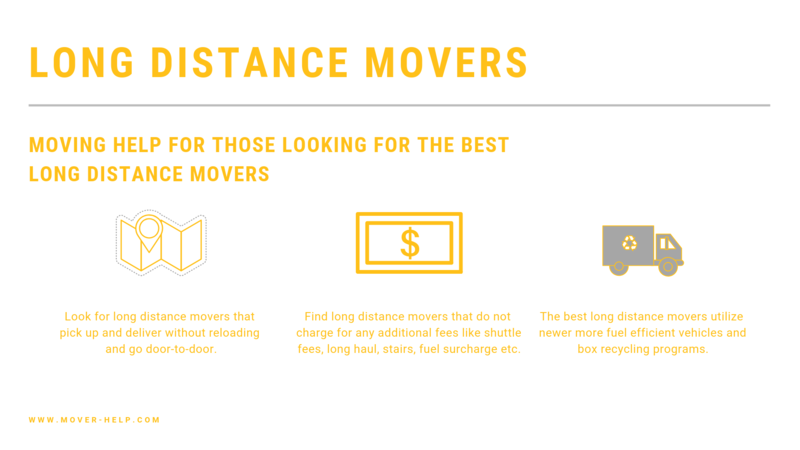 Here are some things to look for and a little bit about the best cross country movers we know! Monster Movers is a long distance moving company that consists of a team of professional movers who are experts in storage, relocation, packing, and specialty shipping. Since 1999, we have been in the business of offering exceptionally prompt and painless moving services around 48 states.T his makes us stand out as the best moving company in the US. We are aware that customers will be glad if they can experience this kind of service, hence, we moved to bring their desires to fulfillment. Since we have made Customer Satisfaction our foremost priority, we always ensure to put smiles on the faces of our clients and customers by providing superior customer service support. We have upheld this principle since inception. To deliver all orders as promised; conducting ourselves with equality and honesty. To be open-armed to everyone from various backgrounds in the community and workplace. To be full of empathy for clients, co-staff, and community. To offer loyal services to all our customers while also responding to all complaints and enquires with attention and accuracy. Our mission at Monster Movers is to continually surpass customers’ expectations in the standard of satisfaction and value on investment. We maintain guaranteed prices on all orders placed on our out-of-state moving services. Cross country moving costs are affordable because we focus on client progress. Our long distance moving services include packing of all furniture items, kitchenware, mirrors, lamps, pictures, electronics, etc. You can be sure that your belongings are safe with us! Our professional long distance movers are also skilled at utilizing moving boxes for packaging your valuables; making sure that all items are prepared for out of state move. On pick-up day, a bar-coded inventory list of all items is made, and we will provide you with a copy. 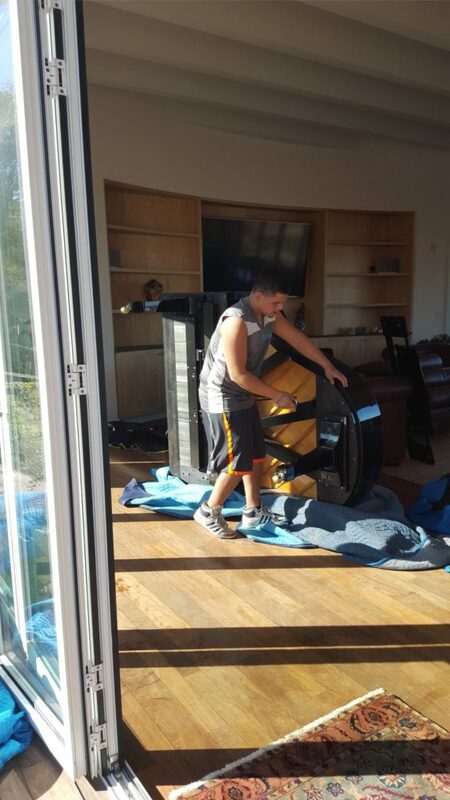 We are professional movers and are simply amazing at what we do. We provide all types of long distance moves from and to anywhere within the United States.Going new places can’t come any easier with our astute expertise in storage, moving, relocation, packing, and logistics services. Our long distance moving company is dedicated to unparalleled problem-solving. Cross Country Moving Company offers competitive rates for every long distance move. Many moving companies offer “low rates” laden with hidden fees and charges. We do not play that game. We provide a guaranteed rate for every long distance move. We also provide free, no-obligation consultations, so you will know exactly how much your move will cost before you even hire Cross Country Moving Company. We also only hire the best movers. Everyone that works for Cross Country Moving Company is a trained, dedicated professional with years of moving industry experience. 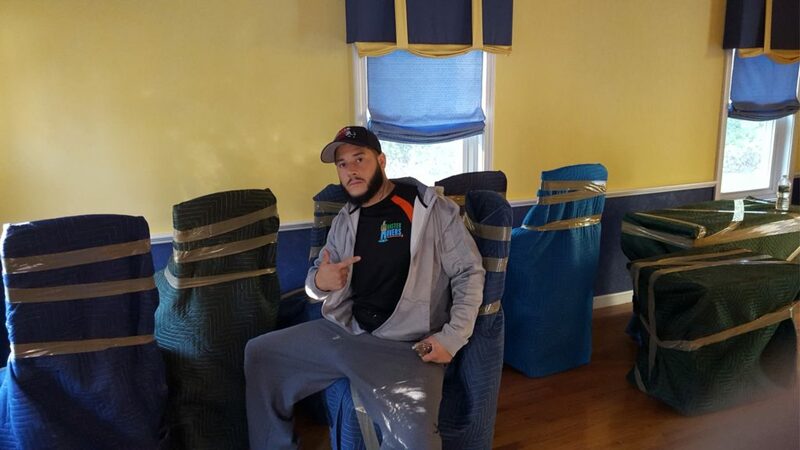 Our movers go through one of the most rigorous training programs in the long distance moving industry. We also carefully select and train our drivers and packing staff to ensure that our customer gets only the very best service. Cross Country Moving Company stands for professionalism. Each and every one of our employees is expected to uphold our ethic of superior customer service. We believe that you should be able to trust Cross Country Moving Company to treat your belongings with the same level of respect and care as we would our own. In our opinion, there is nothing more important than providing the customer with absolute best service. 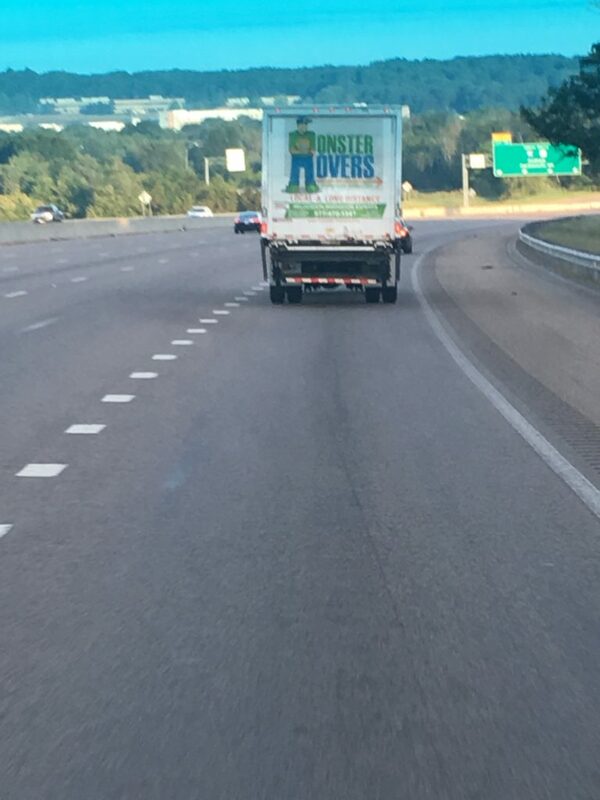 Our customers trust us to safely transport their most valuable possessions because of our reputation for unbeatable service and outstanding professionalism. When it comes right down to it our job is about making your moving day as stress-free and enjoyable as possible. Hundreds of extremely satisfied customers have discovered how easy moving can be when you have Cross Country Moving Company on your side. We have remained the most trusted name in long-distance moves and our customers continue to provide us with overwhelmingly positive reviews. When you are in need of a moving service you can trust look no further than Cross Country Moving Company.